This adventure started in London on Oct 10th 2000. For some reason I had decided that I wanted to see the English countryside and take the long, scenic route to Donegal. After a long journey of three trains (Yes, I survived British Rail!) a 3am ferry across the Irish Sea, and a final leg across Ireland, I arrived on the 11th at 11am. This was exactly two hours ahead of my estimated schedule, 'so far so good'. At the Abbey Hotel is where I met my brother Dan and our talented host, Michael McVeigh. We had lunch and then headed North through the Blue Stack Mts to the North West tip, right on the coast of the powerful North Atlantic. That first night our team met at a local pub in Downings, to get aquainted and discuss our plans. We enjoyed a pint or two while watching the Green Machine (Irish Nat'l Soccer Team) dominate Estonia in a World Cup qualifier. Seeing Ireland play live was a special, rare treat for me. What we discussed that night turned out to be a legendary fishing trip, a mission to catch the one and only Ronnoch Mor! The Irish call them 'Ronnoch Mor' which translates to giant mackerel. The scientific name is thunnus thynnus and this is one of the most sought after big game fish, which will give you the fight of your life. It's the one fish that can take all the strength from you. Giant Bluefin (over 350lbs) can be taken on specially designed equipment, which is exactly what both Dan and Michael use. Catch one with the wrong gear, they will empty (spool) your reel, or take your whole rod in seconds. These fish are built for speed, having an efficient torpedo shaped body with a lunate shaped tail fin. Bluefin tuna can grow to almost 1,500 pounds and close to 12 feet in length. They have incredible endurance and can reach speeds of over fifty miles per hour. They say that once you catch your first one, you are addicted for life. But would I ever have a chance to witness this? The odds were long. Sometimes Dan goes seven or eight days without catching one, our window of opportunity is two days, three if we are lucky. If anyone could pull this off, it is Dan. He has a sixth sense that not many have, and he has reeled in hundreds of these bad boys. I had helped arrange this trip so that Dan, skipper of the FV Sorry Charlie (North River, Mass.) could show Michael, Kevin and Clive how he catches tuna (rod & reel). Dan catches bluefin, yellowfin, albacore, bigeye, and allison tuna off of the Massachusetts coast. He has been perfecting this for almost 20 years now. He actually went on a 'scouting' trip to Ireland several years back, driving up and down the West coast of Ireland interviewing local fisherman to find out if they had seen any bluefin. He heard fishing tales confirming his hunch, but wasn't sure if he would ever really have a chance to go and catch one in Irish waters. 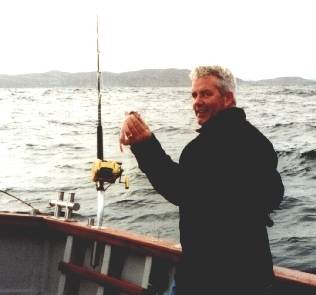 In April 2000 fate smiled upon us and I helped hook (no pun intended) Dan up with Clive Gammon, who is a professional angling journalist in the UK who happened to be looking for a good bluefin hunter. I was able to work my way in as the teams' photographer, and the rest is history. We were fishing out of the resort town of Downings on the North West coast of Ireland. Just steaming out of the harbor was worth the long arduous journey. What a view, quite the sight for sore eyes! 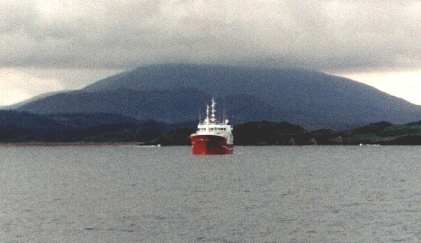 Irish Trawler at Sheephaven Bay, Co. Donegal. (History)In the background is Carraig Ghoill (Goll's Rock) where (according to ancient legend) Fionn McCumhaill is said to have slain Goll McMorna of the Fianna more than a century ago. Fionn was leader of the Fianna and was one of the greatest of all the Irish heroes. 'Fian' or Fianna has a number of definitions, with the most common being foot soldier. Indeed, a distinguishing feature of the Fianna is that they almost always fought on foot. The main function of the Fianna was to maintain and uphold the principles of justice and order within Ireland. 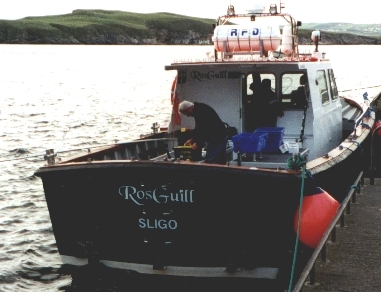 Michael runs the Rosguill fishing and diving charters, and his lovely wife Heather runs Baile an Iascaire Lodge. It's located on the Atlantic Drive in a small and scenic fishing village named Dooey, just beyond Downings Pier. We stayed in the white cottages to the left. To get here, we passed through some of the finest scenery in Co. Donegal, a county full of scenic and historic tourist attractions. It has miles of beautiful coastal scenery and headlands including the Slieve League, which has the highest sea cliffs in Europe. The 'Bloody Foreland' stretches down to windswept deserted beaches. This is the largest remaining Gaeltacht area where Irish is spoken as the native language. Almost 30,000 people still speak fluent Irish here. The county is called Dun na nGall in Irish, meaning fort of the foreigner because Donegal town was a Viking stronghold in the 9th century. This area is also one of the best salt water fishing locations in Europe, anglers come from all over to fish here. There is a annual shark fishing tournament every August. Just off the coast there are more than 100 wrecks, mostly ships sunken by German U-boats in the wars. These wrecks make great fishing and diving locations. A sea that has great shark fishing is not a place that I would be eager to go diving. As we found out quickly, the waters off the North West coast of Ireland can be extremely dangerous. We were able to get 3 days of fishing in one week, not bad for October when the gales blow almost every day. After two days of preparation and mountinous waves that kept us ashore, we had serious doubts as to our chances of fishing on Friday the 13th. On the 12th at just about midnight, Dan had a solution: "If we do 2 shots of whiskey each, it will guarantee a hangover, and therefore, good weather! Bottoms up, its our duty". I was the only other one that fell for it, but it seemed to work. There was a full moon that night that looked stunning, reflecting off the waves in Sheephaven Bay. On Friday the 13th, we were able to make our first attempt at the powerful 'Ronnoch Mor' aboard the Rosguill. Michael has been fishing these waters for decades. The seas were massive but I felt very safe, especially after seeing the dozens of angling trophies that he has won over the years, on display at Fishermans Village Lodge. Nobody knows these waters better. Our first day out to sea proved to be as unlucky as advertised. I had a great time catching the small fish for bait. Just drop your line in the water, wait until it touches the bottom, and reel in three at a time! No hesitation. We caught grey gunards, mackerel, scad, and dinner (pollock), but when it was time to catch bluefin, nothing. The swells were monsterous that day, and the pills didn't quite keep me from getting sick. What a disappointing day this turned out to be. By the time Michael brought us in, he was relying on GPS and radar to navigate. We were basking in the full moonlight again, and the views sure helped ease the pain.